Monitoring the moisture content of any material or surface is very essential and there’s no better tool to help you do this than a moisture meter. An imbalance in the moisture level, be it too little moisture or excessive moisture, can cause problems. It can lead to corrosion, bacteria growth, undesired mold, cracks or other issues. These small inexpensive devices are not only convenient but can help you get accurate and reliable measuring results. However, shopping for a moisture meter is not a walk in the park. With the wide range of models in the market, it can be a bit challenging. In light of this, we’ve put together a list of the best moisture meters out there geared towards helping you find the right model for your application. Also included below is a comprehensive guide that clearly points out the key features you should look at to be able to make a more informed decision. After going through these reviews and our detailed guide, you will find it easier to pick the model that suits you best. What Is A Moisture Meter? A moisture meter is a portable calibrator that measures the percentage of water within a given substance. It’s basically divided into two types, there’s the pin moisture meter and the pin-less meter. Both are often used to determine moisture levels in a range of materials and surfaces including wood, concrete, soil and other solids and semisolids. Moisture meters measure moisture content by either transmitting an AC signal between two electrodes attached to the unit or through sensor pads by direct contact with the surface of the material. The readings are displayed as the moisture level on the meter, either digitally in an LCD window or by an analog gauge needle. Who Will Need A Moisture Meter? A moisture meter is designed for a wide variety of applications and uses, so it all depends on your need. If you are woodworker, carpenter, floor installer or you work often with wood, then a wood moisture meter is a tool you will certainly need. For contractors or building inspectors, you might need a concrete moisture meter to help you in determining moisture levels in walls and masonry. It’s an essential construction appliance that you just need to have whether building a new deck or flooring with a concrete base. If you are a serious farmer or gardener, then you will find value in investing in a moisture meter for plants. It’s an important device that can assist you easily determine whether your plants need to be watered and when to water them. Grain vendors or those who often buy grains like corns, soybeans and sorghum can find a grain moisture meter extremely beneficial. The amount of moisture in grains can affect their value as well as how well they store, so a moisture meter is an essential too that can help you avoid ending up selling rotten grain. What Is A Soil Moisture Meter? A soil moisture meter is a hand-held device designed purposely for determining the moisture content in the soil so as to give a farmer or gardener a good idea of how well to transform the soil to best suit the needs of the type of plants they plan to grow. Many soil moisture meters utilize pin sensors to establish the moisture content in the soil. The tip of a soil moisture meter consists of two metal probes that are inserted in to the soil. Once inserted in the soil, the meter sends electrical currents into the soil upon which the moisture in the soil acts as a conductor to pass the electrical current between the two pins. It basically uses the electrical conductivity of water in gauging the level of moisture in the soil. The higher the electrical current, the more the amount of moisture in the soil. It’s usually comes with a gauge with colored marks that gives generalized moisture readings ranging from dry, moist to wet or just dry and wet. The Sonkir MS02 is arguably one of the best soil moisture meters available in the market today. It’s a simple, very effective and reliable device that’s not only highly affordable but offers more than just measuring soil moisture content. To start off, the unit is pretty well constructed with the main housing consisting of a thick, high-grade that can withstand harsh outdoor conditions. The two probes are also quite sturdy and not likely to bend easily even with regular use. They have sharp tips that will allow them to penetrate into different types of soils without requiring a lot of effort. It’s something that’s certainly going to serve you a longer period of time. The whole unit is really compact and lightweight weighing only 2 ounce, so it’s very portable and easy to carry out. Combined with the solid, durable construction, it’s ideal for both outdoor and indoor use. You can use it in farms, lawns as well as gardens. However, what makes this Sonkir MS02 meter really stand out is its 3-in-1 design. You can use it to determine moisture and pH level of the soil as well as the sunlight intensity which are three of the most important conditions that affect soil quality and plant growth. The major highlight of this design is the use double-needle detection technology which is a highly effective technology that strongly enhances the accuracy and speed of detecting and measuring soil moisture and PH levels. The unit uses a cooper and aluminum probe each 7.9 inch long. With just 2 to 4 inches deep into the soil, you get precise moisture reading on the scale. The moisture sensor is positioned right next to the tip of cooper probe, so it’s able to deliver accurate moisture readings at various depths as well. It has a range of 1 to 10 with colors codes to denote dry, moist and wet moisture levels. It measures the PH levels in the soil quite well with the sensor located slightly above the moisture sensor on the aluminum probe. It can measure the PH from 3.5 to 8 which is a fairly decent range that will help you know if your soil PH needs improvement. The light sensor functions well too and although it will not give you cumulative readings, it gives pretty accurate measurements at the time of reading. You will need to take readings throughout the day so as to know the amount of light your garden gets. Another commendable thing about this Sonkir meter is the fact that the needle gauge reacts quickly once you insert the probes into the soil. You don’t need to wait more than 10 minutes. It responds instantly when measuring any of three conditions. The unit itself is simple to operate. The functions and features are easy to use and understand. The readings are projected on a three-way scale with the moisture content and pH scales color coded for easy reading. It’s a straightforward device. You just need to toggle the switch and select the function you want to measure and drive the probes into the soil to get the readings. That’s all. Now the best part is that you will not have to change batteries every other time because no batteries are needed to run this moisture meter. It is solar powered which makes it highly convenient plus you can use it almost any soil condition. The only minor gripe is that the pH scale cannot indicate below 3.5. Furthermore, you can’t leave probes in the soil for a long period of time as they may rust. Other than that everything is amazing. To sum it all, the Sonkir MS02 is a versatile unit that will deliver accurate results and much faster whether measuring moisture content, pH level or sunlight intensity. It really strikes a perfect balance between quality and value for money. 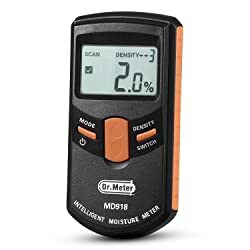 If you are looking for an affordable, durable and reliable moisture meter that can help you to better understand and improve the condition of your soil, then we would absolutely recommend this one. If you don’t want nothing fancy, but just something that can work effectively without requiring you to dig deep into your pocket, the XLUX T10 might just be the right option for you. It’s probably the simplest soil moisture meter you will find out there. In terms of built quality, the unit feels pretty solid constructed from a good quality plastic. It’s one of the most affordable unit on the market but despite that, it’s built to last with quality materials. The best part is that XLUX offers 18 month warranty for this unit from the time of purchase and it includes a cover for any quality related issues whereby you can get a replacement or a refund. Therefore, as far as durability is concerned, this is a meter you can expect to last. Designed for testing moisture content only, the T10 will offer quick readings. The unit utilizes a single probe detection technology. It has 7 inch probe that’s very solid with a pointed tip that will penetrate most surfaces with little force. You just need to insert the probe into the soil for about 3 to 4 inches to get your reading. Although it uses a single probe, the meter will deliver a relatively accurate measurement which it makes ideal for the average home gardener. The unit provides the moisture content readings on a scale of 1 to 10 and has an additional colour-coded reading system to give you a more generalised state of your soil’s moisture content. The levels 1-3 denoted by a red color represent dry soil, 4-7 denoted by a green color represents moist soil while wet soil falls in the 8-10 level denoted by a blue color code. Therefore, it allows you to easily gauge the condition of your soil and take the appropriate action. If you only want to test for moisture, then this is a hassle-free unit that you will certainly like. It will precisely register virtually all soil no matter how wet or dry the ground is. The large dial, including the color-coded reading system makes the entire process of using and knowing the soil’s moisture levels quite straightforward. Furthermore, a detailed description of the best moisture condition for various plants has been included on the back part of the package. Therefore, apart from just measuring the moisture, you will have the necessary information to help you utilize the readings so as to achieve the optimal moisture levels required for your plants to grow strong and healthy. The unit weighs around 0.8 ounces which makes it the lightest soil moisture meter we’ve reviewed. It’s very compact too and with the quality construction, you can effectively use it indoors as well as outdoors. Another big plus is that like the Sonkir MS02, no batteries need to operate this meter. It’s that cost effective and convenient. However, same as the MS02 and most other soil moisture meters, this too cannot be left in the soil for a long time as it’s likely to rust. All in all, for a simple and reliable way of determining moisture level in the soil only, the XLUX T10 is an option worth considering. It’s a very basic and inexpensive device, but works as well as most other soil moisture meters within the same range. We would recommend the Dr. Meter S10 if you are looking for a soil moisture meter that is easy to read especially as a first-timer since all you have to do is plug in the probe. You also get a chance to utilize a measuring range of 10 scales with this soil meter hence getting nothing but accurate readings from your plants. Its sensor probe goes up to a depth of 200 mm which is relatively depth it ensure reliable readings. When it comes to displaying the readings on the display gauge, the moisture level is denoted in a range of 1 to 3 which represent dry soil, 4 to 7 representing moist soil and 8 to 10 to indicate wet soil. You can mostly get accurate results when you use it on cactus, orchids and other plants with thick leaves. Additionally, you can use the meter on any types of soil, clay, sand or loam as long as you do not leave the meter in the soil for too long since it’s likely to start rusting. It delivers the reading fast too. When inserting it in the soil you can watch it give you readings as it penetrates the soil. However, it will display precise readings on all type of soils apart from the ones that contain many pebbles. It is also not advisable to use it on hard soil ground since there is a high risk of damaging the sensor probe. You can comfortably put it in your pocket when going to use it on your farm since it is only 8 inches long and weighs only 2.4 ounces. You can never over or under water your plants with this tool since its package comes along with a printed pamphlet with some water tips. In short, there’s nothing much to worry about Dr. Meter, it’s a quality soil moisture meter that’s designed to offer reliable readings on different types of soil. It’s an option we would recommend to anyone who is too keen on accuracy. In case you are the type of gardener or farmer who loathes to make compromises when it comes to the well-being and health of your plants, then the yoyomax soil test kit is definitely the one for your plants or vegetables. For one, it is an economy kit; it tests moisture, PH and also sunlight. We have reviewed it as the most unique product since it gives you details on the condition of your soil. Which enables you know if you need to add nutrients to the soil for healthier plants. When it comes to measuring either of the three components in the soil, all you have to do is plug in the probe in the soil and just give it a few seconds to indicate your results. In case you are wondering about its size, it is only 13 x 4.1 x 1.5 inches meaning that you will easily grip it when working. In addition, with the yoyomax soil test kit you can never over or under water your plants or flowers in the garden since it will clearly indicate the amount of water your plants need. With its 3.2 ounces, you can carry it with your hand while going to the garden. However, this tool is only limited for use in the garden. It is wide enough to incorporate two displays. One that indicates the levels of measurements and the other that indicates the moisture, sunlight and PH. Both of these displays are clear and visible enough to show readings. However, you have the privilege of adjusting the light for more clarity. In fact, you can use these soil moisture meter both while indoors and outdoors. Notably, you cannot use its 8mm sensor probe on hard soil ground since it is not strong enough and will immediately break making the tool useless. It does not rely on batteries or electricity meaning that it is going to save you some expenses. On purchase, there is thirty days return policy and the tool comes along with a one-year warranty, meaning that the manufacturers believe in their product. It also has a manual guide that you can use to direct yourself while using it for the first. Yoyomax soil test kit is made of copper and aluminum which are both strong metals meaning that it will give you good service and some good worth of your money. We recommend this tool if you want your plants to be healthy, glowing and growing in the garden. The Fomei 3 in 1 soil test kit is another versatile moisture meter that’s really affordable, functional and practical. If you want more than just measuring moisture content, then this is a good alternative as well. One thing to note about this model is that it’s a 2019 upgraded version. It has been upgraded to enhance its accuracy, so you can expect to get reliable readings when measuring both moisture content and PH level as well as sunlight intensity. It is very easy to use, all you have to do is choose what to measure between PH, sunlight, and moisture and insert the probe in the soil. Besides that, you can use its sensor probe that goes to a depth of up to 4 inches into the soil to get the readings in just a few minutes. The readings are quite accurate with the PH scale ranging from 3.5 to 6.5 for Acids and 7 to 8 for Alkaline. When it comes to measuring sunlight, it measures from a range of 0 to 2000. For moisture it ranges from 1 to 10 with 1-3 denoting dry, 4-7 denoting moist and 8-10 wet. In addition, it is only 2.4 ounces and has a solid yet ergonomic design which makes it really portable. It completely does not require batteries or electrical connections so you do not have to worry about it switching off on you in the farm. The aluminum and copper probes feel quite strong and have sharp tips for easy penetration. However, they might not be ideal for use on very dry grounds with pebbles. It’s good for use on sandy, loam and clay soils. If you are serious about gardening this Fomei 3 in 1 soil test kit will definitely be a very invaluable companion and is sure to make your work a whole lot productive, easier and fun. Measuring soil moisture content will be a lot easier and effortless when using this Luster Leaf 1820 Rapitest soil moisture meter. It’s one of the simplest unit to use and it’s specifically designed for measuring moisture content only in soil. It is very easy to use, even as a first timer, all you have to do is just plug in the probes and get your readings in a matter of a few seconds. Its gauge displays the moisture readings on a scale of 1 to 10. The LCD digital display makes the work easier since it displays the measurements in numeric as well as in three color codes denoting dry, moist and wet. Besides that, it also has a long string attached to it that you can use to pull the sensor probe from the soil once the tool is done measuring moisture from the soil making it a very unique product. The sensor probe goes as deep as 8 inches on the soil which is relatively high. In addition, the screen light is really adjustable hence you can use the tool even in broad daylight. It will immediately indicate when your flowers or plants need watering because it measures the amount of water on the root level. It delivers the readings very fast hence you won’t waste any time working with this tool. The tool does not need any batteries in order work so you do not have to worry about replacements every other time. In general, this is a very decent moisture meter for anyone doesn’t want anything fancy. It’s very basic and only does one job, that is to measure moisture content and it does it really well. What Is A Professional Moisture Meter? A professional moisture meter is basically a highly effective moisture measuring tool designed for professional use and for specific materials like wood, plaster, leather, and agricultural products like grain, hay and hops. It’s meant for commercial application and feature an integrated test prods plus a digital LCD-display that shows a clear structured description. It provides material=specific measuring. A pin-style moisture meter is a moisture meter that uses the principle of electrical resistance to determine the moisture content in a particular material or surface. It has a pair of nail-like pins or probes that are driven into the material. Once inserted, a small electrical current is then passed between the two pins whereby the amount of resistance is harmonized into a moisture content reading. Since water conducts electricity well, the meter is capable of determining the amount of water that’s present in the given material based on the amount of current that travels between the pins. A pin-less moisture meter on the other hand is a meter that utilizes the electromagnetic wave technology. Instead of probes, it has a sensor plate which is held against the surface of a given material. The meter works by sending out electrical waves that create an electromagnetic field within the area under the sensor pad and the material. The unit is then able to detect changes in the field caused by the material and moisture. It then correlates the change into a moisture content reading based on the signal it reads back. The benefits of professional moisture meters are seemingly endless. They have a wide application and below we’ve highlighted key areas where using a professional moisture meter can be extremely beneficial. A professional wood moisture meter is an essential tool in woodworking industries like furniture makers. By checking the moisture content of woods, woodworkers can be able to determine whether the wood is ideal for use or not. It can held them minimize splitting and cracking in their furniture or wood beams so as to ensure a quality final product. A professional moisture meter can also help a wood installer to ensure that wood is dry enough for installation. A professional moisture meter can as assist a homeowner in assessing whether wood is dry enough for painting or staining. It’s also ideal for assessing firewood for its suitability for burning as moist wood can create all sorts of emissions that can coat your chimney. It develops more smoke plus it can take a lot of time to burn. Therefore, using a moisture meter can easily help you avoid all these problems. The detection of moisture can make a whole difference between a successful and safe project, and one that will require to be redone. For instance, concrete flooring with high moisture content can undermine an entire construction process plus buildings where the foundations are not well cured can be left unstable hence posing a great risk to the occupants. Due to their accuracy and reliability, professional moisture meters are very useful for detecting moisture issues prior to installing flooring systems over a concrete slab. It can help contractors to gain more accurate information about the moisture content deep in the slab so as to estimate if it’s ready to be built on. It’s an essential tool that can facilitate successful and safe flooring and drywall installations and maintenance. Professional moisture meters can save home and building inspectors as well as their clients thousands of dollars and many hours in identifying the extent and exact location of water damage. Structural and safety hazards like mold, decay and rot are all potential consequences of excessive moisture levels in building components such roofing, drywall, roofing, plaster and siding. Inspectors can utilize moisture meters to identify moisture which would not otherwise be so apparent. They can help them easily determine potential problems and damage to a structure due moisture buildup. Moisture meters also offer the most cost effective way of measuring moisture for restoration specialist. In remodelling or restoration of older homes or even structures damaged by water, it’s vital to measure levels of moisture so as to make the proper repairs. Therefore, restoration specialists can save their clients tons of money by using moisture meters prior to carrying out any repairs. In addition, moisture meters can be useful in determining if a home is once again safe and suitable for occupancy when it has been vacated as a result of flooding. A moisture meter can as well come in handy when purchasing a home as an inspector can use it to establish whether the house has leaks or not. When storing grains, corn or hay, it’s necessary to control moisture and as well be sure about the conditions because mold thrives in a damp, cool environment. Over time, it can begin to grow either on or inside an affected small grain and eventually spread out ruining an entire production. Therefore, it’s vital to prevent mold growth and moisture meters can help farmers have control of their stored grain, corn or hay. With a moisture meter, a farmer can easily know for certain whether their grain or hay is dry enough or not in just a couple of minutes hence saving time and preventing the potential for a great loss. Moisture meters prove to be very useful when it comes to determining the levels of moisture content of boat materials. It’s possible to assess a boat condition just by visual observations but this might really be a much reliable method. A moisture meter provides a more specialized, accurate and fast way for testing and determining moisture and water problems on boat parts. It gives you a complete, safe method for identifying excess moisture in wooden boats as well as GRP (Glass Reinforced Plastic). You can use it anywhere on a boat to get reliable results. It can allow a user to confirm if a wooden boat is dry before varnishing or painting. It can come in handy also in determining if racing boats are carrying excess moisture weight as well as to trace bulkhead and deck leaks. The General Tools MMD3E is the best professional moisture meter to grab for anyone who needs something reliable that offers a wider application but happens to be on a budget. It’s really a great deal looking at its performance and it can be used not just in woodworking but also in building and construction. The unit has a very robust plastic construction that seems quite rigid and durable. It’s ergonomically designed to fit comfortably in your hand without feeling heavy. The built in pins are also strong made from stainless steel with sharp tips. In short, it’s well built and can give a couples years of service. The sharp pins and firm grip will make inserting it into a piece of wood or any other material fairly easy. There’s a protection cap that also doubles as a calibrator checker, so it’s one well-built meter. Looking at the performance, the MMD3E is a meter that can be used by almost any professional out there especially those working with wood. It’s effective at measuring how much moisture content is apparent in wood. All it takes is to stick the two stainless steel pins at the top into a surface and the tool responds immediately with the moisture level readings. It has a fairly wide measuring range at 5 to 50% for wood while in other materials it measure the moisture content in the range of 1.5 to 33%. We found the readings in both wood and building materials like concrete and drywall pretty accurate. You can expect to get correct measurements every time. As we mentioned earlier, there’s some versatility that comes with this General Tools digital moisture meter. It doesn’t just work well with wood. It has a drywall measuring function as well and you can also use it to measure in sub-floors, concrete and carpets or even to locate leakages after flood damage. These are applications that you are not likely to find in most other models that fall in this range, so it’s something worth noting. The readings are delivered on an LCD display as a percentage which is bright and very clear to provide a quick and easy reading. There’s is also a high, medium and low-level indicator with color-codes which is a nice touch that will allow you to see the level of moisture content at a glance. The controls are basic too and the device beeps to alert you when it gets a reading. You can lock in your current reading using a hold function which means you won’t need to hold the meter on in order to freeze a reading. The unit comes with a standard size 9V battery that can last about 2 months which is a relatively decent life but good thing is that it has an auto power off function. When idle for long, it will automatically turn off to save power, so if you won’t be using it often, it a can little longer. One notable issue with this meter is that you might not necessarily get a reading the first time. However, this is not always the case, so it’s not something that you will have to worry about all the time. In addition, it would have been much better, if the battery was rechargeable with USB port for charging. Overall as far as performance and durability are concerned, this General Tools MMD3E moisture meter is the real deal. It gets the job done at very budget-friendly price. A professional moisture meter has never been this affordable. With only a few dollars you can purchase this tool and use it to measure moisture on finished walls. Its non- invasive sensor probe scans large areas of up to a depth of 20mm and leaves your walls undamaged. Besides that, it detects moisture in its early stages to prevent mold growth and leads you to the source of the leak in case there is any. However, you can also use it to measure 5 to 50% moisture on hardwoods and softwoods and still get highly accurate results. The tool comes along with 9-volt AA batteries hence you do not need to purchase some and also has a battery low notification alert. The 2-inch digital display which uniquely has a 3-color LED bar graph indicates your readings in a very visible and clear way even in those poorly lit rooms. It has the clearest display we have reviewed for you yet. All its buttons are boldly labeled hence you will not struggle controlling it during your first few times, plus it comes along with a manual guide to direct you on how to operate it. In addition, as you work with it, you can use the hold button to freeze the display in order to record your readings. If you leave the gadget inactive for too long it automatically switches itself off hence maximizing its battery life. The general tool MMD7NP is made in a design that is very easy to grip by your hand, as much as it does not have a wrist band, so convenience is assured. With its 1.1 x 3 x 6.5 inches and 4.2 ounces you can easily carry the general tool MMD7NP even at the work site. Once you order the moisture meter you get a 30 day return policy and a one-year warranty. This means that in case the product fails to function it will be replaced. Evidently the producers have great confidence in their product and so, that gives you an assurance of buying a high-quality moisture meter. In addition, the product comes packaged in a very strong and protective cover which prevents it from breaking in case it falls down. The cover also offers protection from dust, water or dirt. There is also an electric code in the package. There is an extra set of sensor pins that you can use in case you prefer that method. With such affordability and amazing features, we would confidently recommend the general tool MMDPN7P for any woodworkers, building inspectors, do it yourself enthusiasts and also water damage remediates. First in line is the general tool TSO6 which not only allows you to easily measure the moisture with its 9mm digital meter in building and wooden materials but also share your readings via its Bluetooth app with your phone. The fact that you can connect the readings from the gadget to your phone makes it easier to read results if it is a two person job being done. The general tool TS06 only consumes around 50mA of electricity which is a bit economical. Besides that, its pin type sensor measures 1.5 to 33% for building materials and 5 to 50% for wood materials. Notably, you can use the gadget to check if there is a possibility of mold growing in both wooden and building materials. It powers on quickly, is easy to adjust between wood and building materials. This tool also helps you track where the source of the moisture is coming from enabling you to control any leaks on time before the walls are totally damaged. Moreover, readings can be tracked over time and placed onto pictures for quick and easy reference points. You also have the privilege of connecting your phone to the general tool TS06 which gives you clearer visibility of the results. The gadget uses a pin type sensor which gives an accuracy of plus and negative 2% which is quite reliable. Unfortunately, it is 4.2 pounds without the batteries which you might find a bit heavy however, the product’s size is 1.6 x 2.8 x 7 inches which makes it not occupy too much space. In addition, it automatically switches itself off after three minutes of inactivity which will help increase its battery life. It is easy to use since the meter gives straightforward readings. If you may need the readings corrected later on in order to prepare a report you can link your smartphone to this tool using Bluetooth and download the tool smart App on your phone to save all the readings for the day. The display has enough light to help collect readings even while working with the tool in poorly lit areas. The readings are also large and visible enough for you, even if you are longsighted. You also have the privilege to adjust the amount of light on the device’s display. It is also designed in a manner that makes it very easy for you to grip while working with it. On purchase, the general tool TS06 comes with a set of 9 volts AA long life batteries meaning you do not have to purchase your own. An extra set of pins in case you misplace the first one. When first laying eyes on the general tool MMIE you will be attracted by its bright display. Yet when finding out the various aspects the tool has the easy to grip design automatically becomes the least impressive. The tool is easy to use since the meter is easy to read and quite effective. It uses a stainless pin type sensor hence giving you nothing but accurate readings from all wooden materials. The pin goes up to the depth of 5mm even on those painted walls in your house and can be used to even detect any presence of mold. Fair enough you are not only limited to measuring moisture on wooden materials but also have the advantage of checking if the walls in your home are dry enough for painting. In case of any flood damages in your house, you can use the general tool MMIE to check water damaged areas to see if moisture is still present. Its meter is able to capture a wide range of temperatures starting from 30 to 110. And with such a wide range, you are in a better position of getting accurate readings. When it comes to the tool’s LED digital display, you have an assurance of reading your results with no struggle even on those poorly lit rooms since the screen light is bright enough. Moreover, the results are highly magnified making it easy for you to read. The tool is 5.5 x 9.6 x 1.4 inches making it not occupy much space on your hand and weighs 4 pounds which is relatively low. The display has a bar graph you can use to detect the percentage of increase in moisture from the walls or wood which will even help you find out where the moisture is most concentrated. The tool will even direct you to where the leak is coming from in case there is one. If you are considering to purchase the general tool MMIE expect it to come along with a protective casing, meaning it is stored away from dust and dirt and you do not have to worry about it falling while in the site since it will not break. In addition, the general tool MMIE automatically shuts down when it’s left inactive for some time. It will also come along with 9-volt AA long-life batteries which will; serve you for so long. In addition, its manufacturers have so much confidence in the tool that they have placed a whole year warranty on it. This clearly gives you an assurance that you are purchasing a tool made of very high quality and in this case, it should be in your moisture detecting tools. If you’re a professional woodworker and looking for best moisture meter that you can use to detect moisture content on different grades of wood, then Dr. meter Upgraded Inductive Pinless might be the best choice. Dr. Meter Md918 uses a pinless design, which makes it inductive adopting HF electromagnetic waves to measure without necessarily punching holes into the wood. It measures 132 x 67 x 26 mm and weighs 95 grams without batteries. Its body is made from an impact resistant ABC plastic, however, there’s no carrying or a holding strap. The LCD display is pretty large with no backlit which saves battery energy though it doesn’t provide great visibility in dark. The screen is designed to display density reading, moisture reading, low voltage prompt and also alert you when you need to make calibration. This model is slick with black and orange color. The orange side is rubberized for a firm grip. Md918 is designed to use three AAA batteries. Dr. Meter Md918 provides high precision with a wide measurement range of 4%-80% RH with exceptional accuracy of 0.5%. You can set different density depending on the grade of timber to be measured. Despite the different range of woods, this model provides a maximum error of 1%Rh+0.5% with some measurement. Therefore, considered highly accurate. It’s very versatile since it works with ten different range of woods with consistent accuracy. Having a four-button design where each has multi-function capacity that allows you to set minimum and maximum moisture content ratio, in case of slightest deviation it will notify you with a sound. The auto power off feature is designed to save on batteries when not in use or if you forget to shut it down. Additionally, on the large LCD display, there is automatic prompting of low voltage giving an indication to change your batteries. Md918 meter has automatic temperature compensation, keeps the timber to be tested on a constant temperature for about 5 minutes. However, keep it away from water, corrosive liquid and electrified objects to avoid damage. It also comes with a one-year warranty and lifetime support. We all know that hay usually needs to be dry. Any sign of moister is a big threat to the farmer. Delmhorst meter allows you to protect your hay from moisture damage that can eventually destroy your bale produce. It is one of the best hay moisture meters that can help you determine when the hay is ready to bale. It is a great meter for hay producers seeking to enhance quality control. Delmhorst F-2000/1235 F2000 moisture meter is built from plastic with rugged construction to ensure quality in durability. It’s orange in color, measuring: 10.5 x 7 x 3 inches with a weight of 10 oz light enough to carry over a bale of hay. It has a bright, clear digital display that shows the accumulated average reading in the presence of moisture. In addition to the digital display, there’s an adjustable alarm with high pitch sound. Delmhorst F-2000/1235 F2000 moisture meter includes a 1235 10 inches probe and uses a 9V batteries to perform its work accordingly. In this device, there’s a built-in calibration check that ensures your device is correctly set before using it. Delmhorst F-2000/1235 F2000 measure moisture content over the range of 6% up to 40% on hay. The readings are made by averaging up to 100 accumulated readings and the results displayed on the digital screen. The F-2000 built-in calibration check ensures the device is accurate all the time. The F-2000 check hay moisture in both windrow and bales. The adjustable alarm allows you to pre-select the anticipated moisture content then, whenever the number is reached the alarms alert you with sound notification. You can easily read the averages up to 100 accumulated readings and results on the bright, clear digital display. However, hay producer finds it more reliable the 1235 inches probe to take the measurement without harming the product. The F-2000 comes with a three-year warranty which also guarantees the quality and durability of the device. First and foremost, the Extech MO55 combination pin/ pinless is not only here to diagnose your moisture problems on cardboard, mortar, wood, plaster, and concrete for up to 50% but also here to spoil you for a choice. You have to two options two choose from, the pin or the non-invasive pinless sensor which reads moisture of up to 1mm. In fact, the tool has moisture icons which provide a visual reference for medium, high and low levels of moisture which will place you at a better place of deciding how to deal with a leakage depending on which state the moisture is. Additionally, it shows the main region affected by the leakage. Also, once the tool has done its reading, its bright display shows the readings on the screen in big clear and visible numeric. Plus there is an audible alert that increases in volume as the amount of moisture in a material increases. The readings show fast on the display and the machine is easy to operate since it comes with clear instructions, all you have to do is just pin the sensor on the material and the meter will automatically give the measurements in just a few seconds. Notably, this is the most accurate method. For the pinless method, all have to do is place the tool on the material and let it detect. Data hold function freezes readings on display. The Extech MO55 is a two in one since you can use it to measure temperature saving you the cost of buying a thermometer. The tool weighs 4.2 pounds and occupies a space of 2.6 x 1.2 x 6.7 inches making it quite portable. Even though the tool switches itself off while in use from time to time, this should not hinder you from purchasing it since you can detach the batteries and switch it on to continue working. Additionally, it has a great design and shape that is easy to grip with your hand. You can return the device in the first year of purchase in case it fails to operate; according to the warranty. The Extech MO55 combination pin/ pinless lacks a lid with a self-calibrating inbuilt feature which is vital. Though it is affordable so you can buy it even a low budget plan. Once ordered it comes along with two extra pins, 9-volt AA batteries, and an installation manual to help you operate it with ease. A protective cover to prevent the tool from collecting dirt and dust is also put in the package. Meet the Extech MO290 Pinless which tops our list due to its unique ability to measure the humidity of up to 100%RH with a sophisticated pinless sensor without damaging walls. When measuring moisture, this professional moisture meter goes as deep as 22 mm which is relatively high. Alternatively, you can use the external probe sensor with a 3 feet cable, to measure humidity in direct contact although this method damages the surface. However, you will get more accurate results from the surface. The Extech MO290 Pinless also has another measuring point which accurately measures vapor pressure of up to 20kPA. Luckily, you can set the Extech MO290 pinless’ low and high alarms to detect a rise or a drop in temperatures and humidity of a surface. You can as well use the model to set a minimum and maximum recording with the moisture meter; its maximum resolution is 0.1, 0.1°F/°C. It is very light since its only 0.32 pounds. You can simultaneously measure a surface’s humidity while measuring its temperature by use of its IR thermometer also without damaging the surface of the material you are measuring. Its thermometer measures up to 8 inches with 0.95 emissivity. It measures from a range of -20 up to 200 degrees Celsius which is also relatively high. In case you are long-sighted, you have the privilege of using its big-sized digital display to comfortably read your measurements. You have the ability to use the minimum and maximum recording buttons. Apart From that, this model has a flashlight that you can use to in those sites that have poor lighting. It also comes with a hammer probe, a calculator to calculate its condensation points plus it is a three in one since it has dew point, grains per pound and vapor pressure measurements which saves you the cost of buying other instruments to measure these. Furthermore, you do not need to carry a calculator with you since this model has one that helps you work on those differential temperatures to condensation points. Notably, not only does it come with a calculator but also come with a long life V9 battery, hence you do not have to purchase one. This battery also lasts long since the equipment switches itself off once left idle for long, however, you do not have to worry about this since the display automatically saves the last numeral fed on the screen. In terms of packaging, you will receive the Extech MO290 Pinless in its own carrying case that is dirt-resistant and very protective hence you do not have to worry about damaging the equipment once it falls while working. Next in line is the FLIR MR77 Pinless. It is among the best moisture meters we have reviewed since it has the flexibility of both an external wired probe and a pinless sensor which are calibrated to measure moisture on building and wooden materials. It exceeds expectations by measuring moisture levels of as deep as 19mm. Another amazing feature is that the FLIR MR77 Pinless has a big and clear display make it easy for you to read moisture, temperature, air and humidity levels. You can easily swap from the humidity to the temperature sensors without being left behind on schedule in the field. In addition to the mobile app, it has an incorporated thermometer which helps it measure quick spot temperatures of up to 8 inches from a range of -28 to 77 degrees Celsius. Hence you do not have to spend extra money on a thermometer. It also doubles up as a psychrometer and hygrometer very few moisture meters come along with this feature. It comes accessorized in a high-quality zipper bag which highly resists dirt and a carriage nylon strap. It has a pinless and an external wired pin sensor for measuring humidity. Its Bluetooth can only connect up to a range of 10 meters. Coming third in position is the Lignomat Moisture Meter Mini-Ligno as the name states it has the Lignomat measuring technology which makes it give the most accurate moisture readings among all these moisture meters we have reviewed, with a measuring depth of ¾ mm. It measures a moisture range of 6-45%. However, the instrument is used to measure the moisture of up to 10mm with an external probe sensor which might damage the surface you are working on. It is limited to measuring wooden materials, both hard and soft wood and dry walls. It gives a 0.5 difference for every 5 degrees Celsius when measuring wood. This model comes along with two different pins whereby one measure the humidity in soft woods up to a depth of 3/16 and the other one measures humidity in hardwoods up to a depth of 7/16. It has a reference scale that measures dry walls from a range of 0-99. Alternatively, you can use the Lignomat Moisture Meter Mini-Ligno to also measure temperature from a range of 20-70 degree Celsius which saves you from purchasing a thermometer. The unit is equipped with an LCD digital display which even on bad lighting conditions and is easy to read the numeric on the screen. It has a resolution of 0.1% below the range of 10%. The display has an automatic shutdown key if not used for long which helps it save the battery life. In addition, on purchase it comes along with life V9 AAA in-built batteries, so, saving you extra costs of purchasing some. It is also really easy to use since it has a manual kit and fortunately, all you have to do is just pin the sensor on the wood and the meter automatically gives the measurements in less than 5 seconds. The chances of making errors while carrying out measurements are minimal too when using this unit. It has a great design and shape that is easy to grip with your hand. You can also use its long strip wrap to carry it around the site. It is also really small, 70x140x25mm which makes it pocket size. The weight is also really light 200 grams, pure plastic which makes it portable to carry around all day. On purchase, this model comes with a two-year warranty which means that you can return the equipment in case it fails to work during the first 24 months of purchase. As much as this mini Ligno lacks an in-built correction point it comes along with a correction table in the manual though this might consume some of your time. In the fourth position is the Marine Moisture Meter Oasis, it consists of a pinless sensor which electronically measures up to a depth of 1mm. The unit also uses an analog meter of 0-30% which measures surfaces without damaging them, the name does not betray it, since you can only conveniently use it in marine surveys. Since the Marine Moisture Meter Oasis has a convenient meter which rapidly detects the water levels well below the surface of fiberglass or even wooden materials, the readings provide high value in detecting leaks, hidden water pockets, and also moisture. You can kill two birds with one stone while using the Marine Moisture Meter Oasis since swapping from measuring the moisture of a surface to the temperature is really easy and very economical. Fortunately, you can use it to inspect damaged surfaces like the fiberglass and woodwork without damaging the surfaces through this method is not as accurate as the other one which uses external pins. It indicates when wood is rotten inside before the gel coating starts to blister inside makes it stand out among the other models in the market. You can easily tell the level of moisture with this gadget by using an electromagnetic device in it which shows the moisture content in a surface. Moreover, it also indicates dry hulls and repairs the dehumidified areas. It is easy to grip since it has a rugged construction. It is easy to use since all you have to do is move the sensor on the surface from one spot to the other and it will indicate the parts that need thorough inspection in seconds. Its power source is the long-lasting V9 battery. Unfortunately, it weighs 2 pounds which is a little bit heavier than the other models and a bit too expensive if you compare it to the others that we have reviewed in the market. However, it is a bit easy to carry around since it has a wrist band attached to it. In case you are wondering about its warranty, it comes with a one-year warranty which means that you can return it if it fails to work during the first 1 months of purchase. It comes with a manual guide which helps operation easier and a protective casing. The Protimeter BLD536 is beautifully designed digital moisture meter that offers both a stylish look and reliable performance. It’s durable, compact unit that’s perfect for anyone looking for a pin-type meter that looks good and can get the job done. It measures up to 22 mm underneath the surface which is decent depth that can facilitate much accurate readings. It is perfect for measuring moisture on buildings. The BLD536 sensor measures from a range of 4 to 80% with an accuracy level of 0.5%, so it can have a wide application and used by professionals ranging from architects to home builders to contractors in sites. Not only does it measure moisture on surfaces but also measures temperature and helps you read the results from the digital LCD display which magnifies numeric on the screen for easy reading. It can also detects the extent of moisture damage, reveals the cause of the damage since it has two modes; an operation search mode and a measure mode. It indicates the change in moisture levels. There are also various colors to choose from with this model. Furthermore, the search mode, which is non-invasive detects the level of moisture underneath a surface up to 19 mm. Its rugged construction makes it easy to grip by one hand while operating it. In two seconds the Protimeter BLD5365 gives displays the readings. It automatically switches itself of ones left unused for long saving its battery life. On purchase, the model comes with some inbuilt 3 x 1.5 Volt AAA batteries. Fortunately, this model is designed for easy gripping and has a long wrist strap attached to it comes with a two-year warranty which means that you can return the product in case it fails to perform in the first 24 months of purchase. It still has the most favorable warranty in the market. In addition, the Protimeter BLD5365 comes with a protected porch that protects it from acquiring dirt. It is 190 mm x 70 mm x 49 mm in size and only weighs 1.25 pounds which means that it is very portable. It also has a standard manual that you use for easy operation the first time. It also has a Cal check gadget. Purchasing this gadget is a long-term investment since it is highly durable. It has the most favorable warranty in the market. Protimeter Aquant BLD5765 is a definition of what a moisture meter should be. This meter is suitable for checking behind or below surface covering of walls, tiles that would usually prevent direct reading. It’s built for use with a wide range of construction materials including masonry, concrete walls, plaster, fiberglass and even drywall. Protimeter Aquant BLD5765 is designed with dual display LCD and LED which makes reading easier compared to other moisture meters on our list. The Aquant is a non-invasive mode which allows you to check the moisture content ratio over a large surface without the need of making holes. Its body is made from pure plastic measuring 175 x 48 x 50mm and weighs 0.32 ounces with batteries included therefore considered relatively light. The LCD screen is built with backlit display suitable even in dark areas, in addition to that the audible tone alerts you in case of any reading changes. The Aquant meter uses 1 9V battery with an auto-off timer. Overall built quality is great for the money. Protimeter Aquant BLD5765 allows you to check and detect moisture up to ¾ which is 20mm beneath the surface to be tested. Being a non-invasive measurement surface moisture doesn’t affect the readings on the screen thereby, providing a bit of accuracy. This model is a two-button operation unit which provides fast and direct readings, therefore, offering smooth and simple operation. It’s also used to measure directly moisture content in a wide range of building materials without damaging the surface. It also freezes the last reading on the screen allowing you to work efficiently. The most selling feature is the dual display. This unique colored changing LEDs indicates or warns on different moisture level with three different colors: green for ‘dry’, yellow ‘at risk’ and red ‘wet’. Besides the colored LEDs, the Protimeter Aquant BLD765 features an LCD screen which scales reading from 70-999, therefore, providing an instant indication. You can use this numerical number and the LEDs feature to compare various location on your surface and note in case of any change. This tool is valuable when surveying, restoration, cleaning or building property that has been damaged by water. Comes with a two-year warranty. Do you want to protect your house against mold growth, but struggle to find an affordable moisture meter that will provide accurate reading? If so, then it’s high time for yourself to get a Ryobi E49MM01 Pinless Moisture Meter. Measuring 1.4 x 5.9 x 8.8 inches with 10.1 ounces weight Ryobi E49MM01 is made from plastic ideal for a hand grip. It is fitted with an LCD screen that displays in large numbers the percentage of moisture content. Additionally, the device is built with audible alerts that will send of the notification sound where moisture is concentrated. Ryobi E49MM01 moisture meter like most of the meter in our top five list is designed with no pins allowing non-invasion measurement. It measures moisture in: softwood, drywall and masonry with a measurement depth of up to a ½ inch (12.7mm) below the surface. The moisture content level; ranges from 5% up to 30% in softwood and relative readings for drywall and masonry. In order to attain a certain degree of accuracy, the Ryobi meter operation temperature ranges between 32 ̊ to 104 ̊degrees Fahrenheit. Ryobi E49MM01 moisture meter requires no pins, therefore, saving you the trouble of drilling holes which will otherwise damage your surface. It’s very simple to operate having a large LED screen that shows in percentage the moisture content on the surface. Despite not having a backlit display the audible alerts give you an accurate reading whenever moisture is concentrated thus being convenient. By in cooperating both sound and sight, you’re able to get accurate readings. It uses 1 9V battery and has an operator’s manual making it easy to use. Ryobi E49MM01 is more effective than pin-type tools since is able to read moisture level as deep as ½ inch allowing you to detect any possibility of molds in your home. A wide operating temperature of 32 ̊ to 104 ̊degrees Fahrenheit. Tramex MEP Moisture Meter is one of the most versatile and easy- to -work with moisture meter used for all kinds of lumber because of Pinless operation standards and fast scanning. It has several features that make moisture measurement process and evaluation of results very fast, accurate and versatile. If you are a contractor or even a DIY creator with a wide range of needs, this device is an excellent choice for you. This device is a product of Tramex build from plastic measuring 8.7 x 4.4 x 2.2 Inches with a weight of 13.6 Ounces. Tramex MEP is non-invasive therefore uses electrical signals to check on the moisture content. This is possible because of both transmitting and receiving electrodes that send out electrons signals which are then used to detect moisture interferences and registers moisture percentage on the dial. However, Tramex MEP is an analog device with a large, clear easy to read display, an audible alarm and automatic time off feature. Tramex MEP is designed to provide a measurement range from 5% to 30% for timber materials, and 0-100 comparative for other building materials. This device allows deep penetration to over 1 inch into the material being tested, however, signal penetration largely depends on the type of material being texted and meter setting. To improve its sensitivity, it uses the external rubber electrodes which comes in direct contact with the material being tested. Tramex moisture meter has a HOLD function which you can use to ‘freeze’ the meter reading until the display can be viewed. Another useful feature is the alarm which indicates when moisture level surpasses a reasonable amount. When measuring you scan the material by placing the device in close contact in order to gain maximum sensitivity thereby making it a more effective meter. Battery operated for quick replacement. The automatic power cut-off switches the meter off when not in use which ends up saving batteries life. Being a pinless meter, it saves you the energy of drilling holes which often damage the surface of the material. It is very easy to use since it always automatic switch back to the last setting making it convenient. All Tramex products are built with quality guarantee and this Tramex MEP is not an exception. It comes with a one-year warranty against defects in parts. This meter is not very accurate. Do not let the price of the Tramex CME4 scare you off before at least looking it its unique and amazing features. For one, it comes from one of the best manufacturers and it has mainly been designed for the flooring industry. It uses the pinless method to give you results from these surfaces in a very fast way and does not damage the surface since it is non-invasive. Its accuracy is 6%. So as to carry out the moisture tests just wipe off any dust from a surface area of concrete, turn on the concrete function and firmly hold the Tramex CME 4 onto the surface. It measures up to a depth of up to 12.5 mm which is a bit high. It indicates the change in moisture levels and also there are various colors you can choose from with this model. Furthermore, when in use it compares the variance in impedance affected by the content of dampness and displays this on a clear, easy to read analog display in the numeric form. There is a hold button for you to use in case you need to record the readings while working. It weighs 1 pound and it is only 8.8 x 4.2 x 2.2 inches making it the lightest and most portable professional moisture meter we have come across in this review. However, it’s not made in a design that is easy to grip by the hand while working which might be a problem. There is a one-year warranty once the package is purchased. It also comes with 9-volt PP3 batteries and a protective case to prevent it from dirt and dust. You do not need to debate about purchasing this tool since it will be of great service to you for years. On arrival, you can use the manual to familiarize yourself with how it works. Lastly, we reviewed the Tramex SMP skipper moisture meter which is made of high quality since it comes from one of the best manufacturers. In addition, its power source comes from the electricity via an electric code. The tool also comes along with a wrist band, making it the most unique among all the tools we have reviewed for you. It measures moisture in both wooden and building materials but it is advisable for boat owners or anyone planning to purchase a boat to use this moisture meter since it quickly traces bulkhead and deck leakages. It uses the pinless method to measure the moisture leaving your surfaces non-damaged. When detecting moisture, this tool provides you with three different ranges for both salt and freshwater moisture results, the low, medium and high ranges. It will notify you of early leakages before the top coat on your floor starts blistering. The readings for wood materials range from 5% to 30% on a hardwood scale and 0 to 100 on other materials. It also notifies you as the amount of moisture goes increasing on a surface by use of an audible alert tone, but you can turn the tone off in case you do not want to use it. When left inactive for long it automatically shuts down to save its battery life. However, it lacks a good design to grip by the hand which is very important for any moisture meter. But it is only 4 ounces meaning it will not be heavy to carry by the hand. You can use the hold button to enable you to note down the readings as you work. The tool has a one-year warranty and in case it fails to work during the first 12 months of purchase, the manufacturers replace it with new one meaning they are confident about this product. The package is shipped to you with both a protective case to prevent the device from collecting dust and breaking in case it falls off and long-life batteries. When shopping for moisture meters or rather any device or equipment, having all the right information can mean a whole difference between buying a quality unit and spending your hard-earned money on a flimsy unit that won’t even operate correctly. In this guide, we are going to share some useful insights on the key factors you should look at when making your decision to purchase a certain type of moisture meter. They include. When shopping for a moisture meter, it’s good to know the type of meter you want beforehand. There are basically two kinds of moisture meters available on the market, pin and pin-less. As mentioned earlier a pin type metre utilizes pins inserted into a material to measure the level of moisture. The advantage of this types of meters is that they tend to give a more exact reading especially when measuring moisture content in woods or materials that have a low moisture percentage. The downside is that you have to drive the pins into the material in order to get a reading and that means leaving some small holes on the material, which you may probably not want to do if you are a furniture maker and wood flooring specialist. Some good examples of pin type models on our list are the General Tools MMD4E, Protimeter BLD5365, Lignomat Moisture Meter Mini-Ligno and the Sonkir MS02 soil moisture meter. These type of meters are contactless. They measure moisture content while lying flat on the material. Like the pin type meters, you can count on the accuracy of a good quality pin-less moisture meter. If you are an artisan or carpenter who often do wood curving or works with wood a lot, this is the best option to go with. It won’t leave holes in your wood. The setback is that it’s not ideal for measuring low moisture percentage. We have a few good examples on our list like the General Tools MMD7NP, Dr Meter MD918 and FLIR MR77. Once you know the type of meter you want, the next important thing to look at is the quality of the model you are considering. If you are going to use it outside mostly, then the device needs to be strong enough to withstand rough work conditions like in construction, flood, renovation and wood mill sites. Having a solid robust construction will help the meter to last longer without requiring too much repairs or replacement. Therefore, consider units that have sturdy casings made from either hard plastics or metals. Meters that will withstand the harsh outdoor conditions. A good option would be to go for a durable meter that can be used both indoors and outdoors, like the General Tools MMD3E or Extech MO55 dual moisture meter or the Protimeter BLD365 dual-function moisture meter. Look also at the probes if you are going for the pin-type meters. You are going to dip them into the material and you don’t want to get something that’s going to break easily. Therefore, they should be quite strong to withstand tough materials. Here, the best option is a unit with stainless steel pins for professional moisture meters. If you are getting a soil moisture meter, then a unit with solid copper and/or aluminum probes would be perfect. How accurate a meter is at measuring moisture content in a particular material is what will set the difference between the best moisture meter and a flimsy unit. You should avoid cheap, inaccurate meters by all means possible if you want to make sure you are not going to have any problems. The best units here are those which are accurate to within 1% or 5% on low end. The former is an ideal choice if you want a high level of precision in your readings. The models that are accurate down to 5% are not that badly off as you will get reliable readings for most applications. Generally, your choice here will depend on your application. For woodworking and flooring, a good range would be around 5 to 6% while for general construction, it can range from 7% to 19% depending on the building material. For any meter, it should be faster and easier to operate. Look for models with simple and straightforward control panel preferably ones that have one or two button control. They are super easy to us. As for the response time, it should be instantly or in the worst scenario, not take more than 3 minutes to get readings. The display should be large enough and present the readings in a manner that even a new or average user can comprehend easily, like using color-coded descriptions to denote moisture levels. If you are planning to get a professional moisture meter, you might also want to consider a unit that has a hold function like the General Tools MMD3E. This is an essential feature that will allow you to lock your current readings especially when working in awkward situations or poor lit areas where you need to bring the device to light in order to read the display. Battery life is an important factor to consider only if you are thinking of purchasing a digital moisture meter. Here, you want to look for a unit that comes with a built-in battery system. The best option would be one that has rechargeable battery probably using a USB port for charging. However, if you can’t get that then look for a model that offers a decent battery life so that you don’t end up having to replace the battery every other time which can turn out to be quite costly in the long run. You might also want to consider a unit that offers some extra measuring functions like the General Tools MMD4E and Sonkir MS02 soil moisture meter on our reviews above. They combine multiple functions into one unit. The General Tools MMD4E comes with both wood and drywall measuring functions while the Sonkir MS02 allows you not just to measure moisture content alone but also the pH level as well as the sunlight intensity. Therefore, it can be very convenient and beneficial to you to invest in a unit that offers multiple functions than one that can only handles one function. When you are looking for moisture meters you will notice that there are too many different types and models in the market. However, we manage to find these 23 meters that had good reputation and looking into them further they turn out to be worth the money. Generally, when shopping for moisture meters, the paramount thing to keep in your mind is your specific application or material that you deal with and the need for measuring the moisture content. Once you have this at the back of your mind, and combine it with the insight from our reviews above and the buyer’s guide we’ve provided, then you shouldn’t have much difficulties picking that best suits your needs and requirements.